Biotinylated Human BCMA, Fc Tag (BC7-H82F0) is expressed from human 293 cells (HEK293). It contains AA Met 1 - Ala 54 (Accession # NP_001183.2). The protein has a calculated MW of 33.8 kDa. As a result of glycosylation, the protein migrates as 40-45 kDa under reducing (R) condition, and 70-85 kDa under non-reducing (NR) condition (SDS-PAGE). Biotinylated Human BCMA, Fc Tag on SDS-PAGE under reducing (R) and no-reducing (NR) conditions. The gel was stained overnight with Coomassie Blue. The purity of the protein is greater than 95%. Immobilized Human BAFF, Fc Tag (Cat. No. 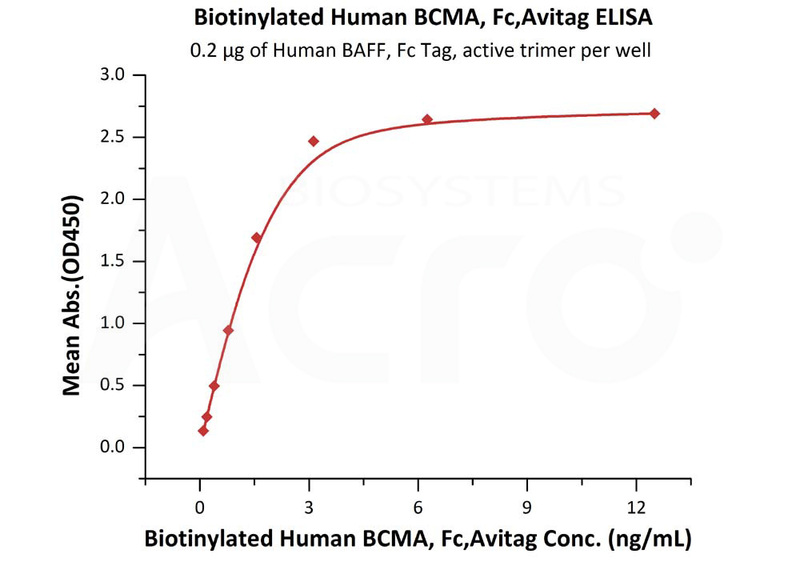 BAF-H4268) at 5 μg/mL (100 μL/well) can bind Biotinylated Human BCMA, Fc Tag (Cat. No. BC7-H82F0) with a linear range of 0.12-1.95 ng/mL (QC tested). 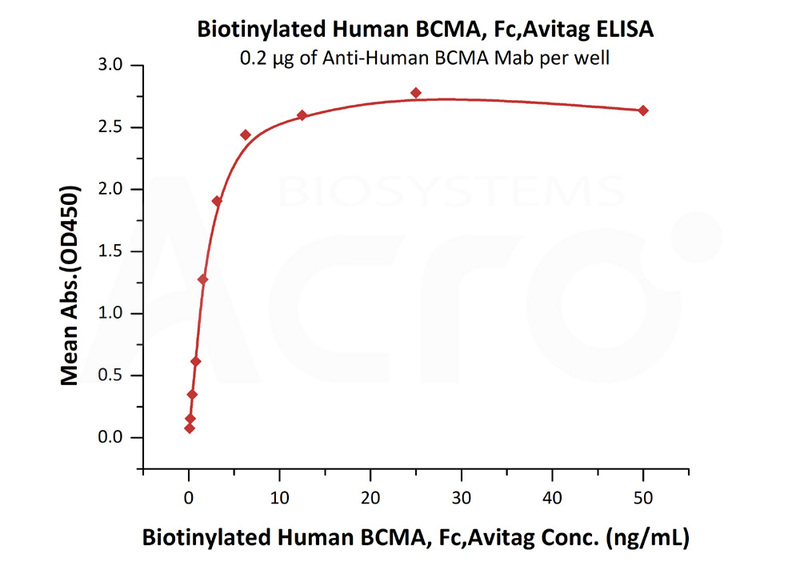 Immobilized Anti-Human BCMA Mab at 2 μg/mL (100 μL/well) can bind Biotinylated Human BCMA, Fc Tag (Cat. No. BC7-H82F0) with a linear range of 0.1-3 ng/mL (Routinely tested). 293 cells were transfected with anti-BCMA-scFv and RFP tag. 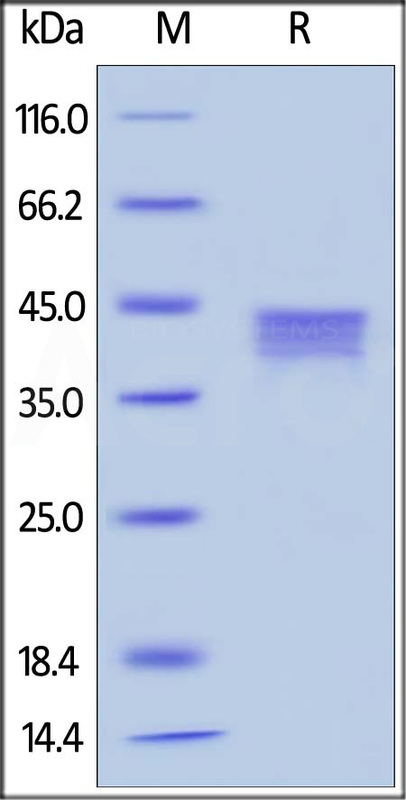 2e5 of the cells were first stained with B. biotinylated human BCMA / TNFRSF17 protein, Fc & Avi tag (Cat. No. BC7-H82F0, 3 μg/ml) and C. biotinylated protein control, followed by FITC-conjugated streptavidin. A. Non-transfected 293 cells and C. biotinylated protein control were used as negative control. RFP was used to evaluate CAR (anti-BCMA-scFv) expression and FITC was used to evaluate the binding activity of biotinylated human BCMA / TNFRSF17 protein, Fc & Avi tag (Cat. No. BC7-H82F0). CAR-T cells based on novel BCMA monoclonal antibody block multiple myeloma cell growth. Authors: Berahovich R, et al. (1) Hatzoglou A., et al., 2000, J. Immunol. 165:1322-1330. (2) Gross J.A., et al., 2000, Nature 404:995-999. (3) Yu G., et al., 2000, Nat. Immunol. 1:252-256.